Photo courtesy of Wikimedia Cafe Nervosa This file is licensed under the Creative Commons Attribution-Share Alike 2.5 Generic license. I had gone to Tokyo on a business trip and was asked was there anything I would like to see. Having a habit of finding old Tourist Books to search for interesting places I was well prepared. There were two things I dearly wanted to see and one was the Tokyo Fish Market - Tsukiji. It was before I had a quality camera but the pictures are none-the-less evocative of the strange magic of each place. Old Fodor Guides are marvellous, for they were written for travellers, not for tourists. A traveller is someone who goes to explore and experience the place and interact with the everyday people, responding to the unexpected with humour and curiosity, and returning with a suitcase full of memories. A tourist is satisfied to travel only within the small circle of things that operate within his own language and habits - so although he leaves home, neither his money nor his mind do. 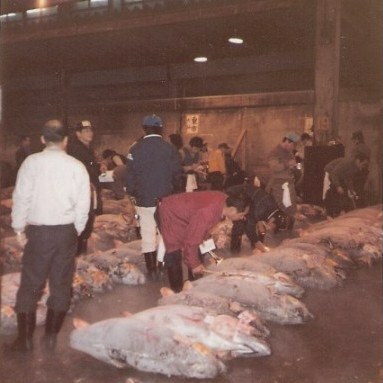 Although officially named the Tokyo Metropolitan Central Wholesale Market, the Tokyo Fish Market it is universally known just by the name 'Tsukiji' and is one of the largest wholesale food markets of any sort in the world – but it is solely for fish. I was fortunate to go there before this once secret destination became so popular and the visitors caused so much disruption to the business of fish, that times and access for tourists were restricted. 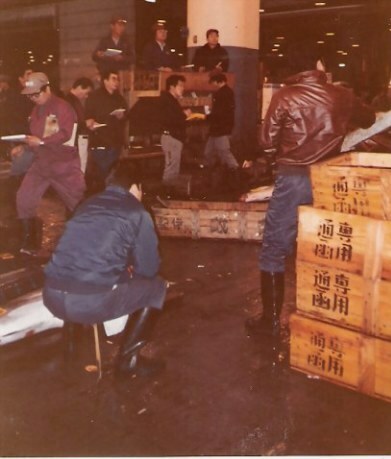 When I was there, I was also able to freely attend the Tuna Auction run by the Oroshi Gyousha or Auction Houses, with tuna laid out on the docks and the fishing ships moored beside. 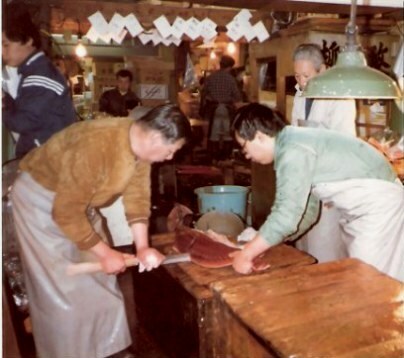 Its 03:13 and the Tokyo fish market is already busily in action. We arrived at Tsukijii at 03:15 and the Tokyo Fish Market was already bustling. 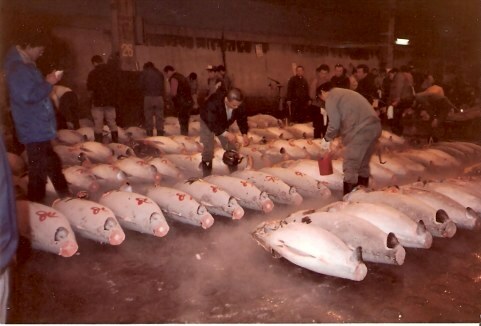 Frozen tuna were lined up for sale, each with an identification mark being painted onto it. 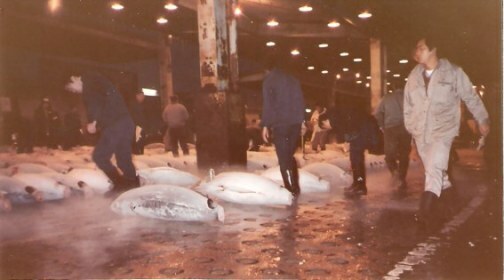 The tuna buyers walked between the frozen tuna, occasionally probing a fish with a small pick at the end of a handle that was about as long as from one’s elbow to hand. Like all fast talking auctioneers that seem to have an ability to almost sing their bids and raise them, those at the Tokyo fish market have this patter seamingly even faster. When the auction began, buyers lined up on a series of wooden tiered steps while others watched, turning their tuna pick upside down and using them as miniature ‘shooting sticks’ or precariously balanced seats. An auction in any language is a small piece of theatre in itself. The hallmark rapid-fire speech of the auctioneer at the Tokyo Fish Market seemed a parody of that fast paced auctioneer spiel that we find hard to follow in any language with which we are familiar. When heard in Japanese at Tsukijii by my ill-tuned ear, the sense that it was a sort of comedic limmerick was amplified. Not just selling fish, the Tokyo fish market sells all things related to their cooking and preserving - and of course eating in tiny restaurants with delicious fare. It was hard to drag ourselves away, but there was a lot to explore with over 900 stallholders within the inner commercial market section, and many others in the surrounding market area (jogai shijo). Because this outer area is a mixture of wholesale and retail shops, as well as fish of every sort, here you can pick up a proper steel knife or any of a myriad of kitchen tools and accessories, or a range of groceries, many of which are unfamiliar to our western habits. Naturally, there are also restaurants serving sushi and other seafood, the best with only 10-12 seats. Be patient. It's worth the wait. This area closes later than the inner market and everything is shut by early afternoon. 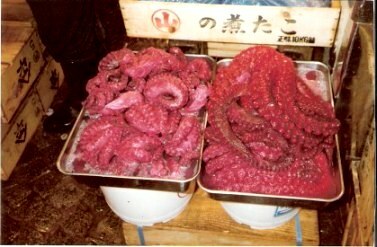 Exotic seafood is sold at the Tokyo fish market - and many types you may never have seen before. Every day there are more than 400 different types of seafood being sold at the Tokyo Fish Market, and I saw a fair sampling. There were boxes of shellfish and sea anemones. Several trays of brilliant red squid tentacles tempted the chef in you. Many types of shrimp and prawns were laid out. They came in all sizes and varying hues and I wondered about the benefits of one over another. I have always wondered about what was the difference between shrimps and prawns. Despite the terminology seeming to vary by country, I discovered that there are, in fact, biological differences.You would have to be keen to note them, as it is primarily a difference of the gill structure and the pincers. Shrimp have branching gills and larger front pincers, while prawn gills are a bit more plate-like. They also generally have larger second pincers and longer legs. Either tastes delicious! At Tsukijii there were so many varieties: northern, spot, pink, white and brown shrimp lying on ice beside tiger, bay, deep water, and my favourite – king prawns. 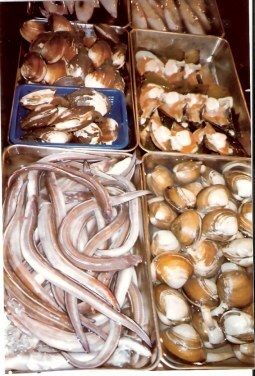 There were rows of boxes of shellfish of all varieties, and also eels. Cutting the tuna with electric saws seemed an exercise in temptation of rapid movement to tthe next life - and the swords seemed just as daunting. 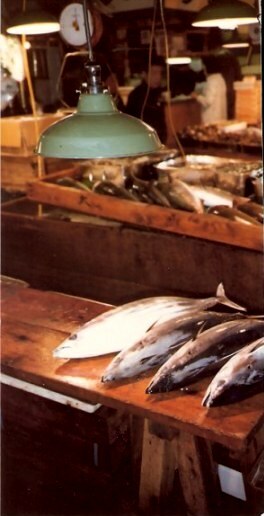 Fish were laid out under low hanging lamps so they could be precisely cut to order. The methods of cutting were unexpected. Frozen tuna required an electric band saw. The operator and bystanders wore rubber boots. One man held a hose so that the water struck the fish at the cut! Electric shock seemed an imminent possibility. The fresh tuna was cut by what looked like swords, but are actually long knives, some over a metre long. These are called Oroshi Hocho, Maguro Hocho or Hancho Hocho. No matter which of these was being carried, they are not the sort of thing you would want to argue with, if confronted by someone carrying one in a dark alley at night! 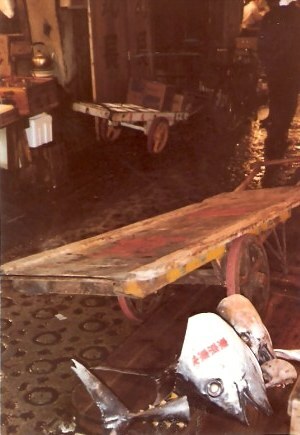 The play of light on the wet tiles highlighted these fish carts in a lovely 'Still Life in Fish'. These images of fish and fire were worthy of a Velázquez painting, each seeming to tell its own story. 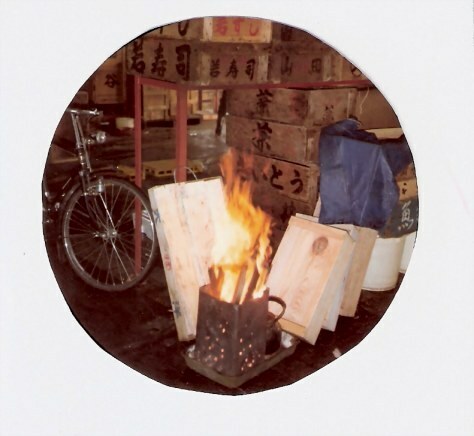 Men stopped to warm themselves at this small brazier – a portable fire place burning superfluous wooden crates and sending its own light onto the glistening wet floors. One lot of clams looked particularly unusual. These are Goeduck clams and the vendor was not unaware of its visual likeness to a part of male anatomy, as he held the most spectacular specimen aloft, laughing. 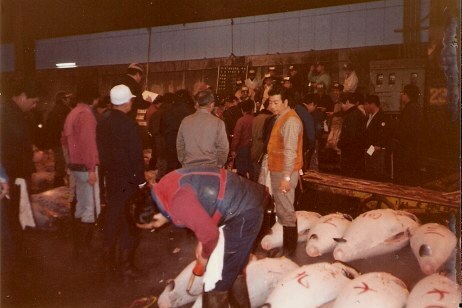 Global fishermen send their catch to be sold in Tokyo at Tsukij fish market. 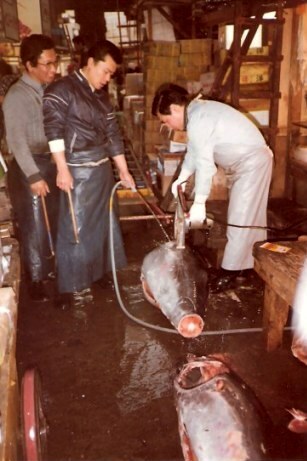 They may have come to the Tokyo Fish Market from the west coast of the USA, Alaska, Canada, or even New Zealand. The name 'Geoduck' has nothing to do with ducks. Instead it appears to be a poorly translated Lushootseed word meaning 'dig deep' used by the Salish Native Americans around Puget Sound, on the west coast of Canada. Sometimes called the mud duck, king clam, or elephant trunk clam, these strange creatures live longer than anything else in the animal kingdom. I learned that their lives span an average age of 146 years. The oldest on record is 168 years old. I am always fascinated about how such statistics are gathered. Did they find a 186 year-old talking clam? 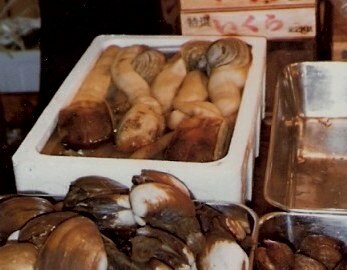 The Geoduck Clams distinctively phallic shape has a long neck or siphon that can be up to 1 metre long (3.3 ft). It's not remarkable then, that they draw a high price – whether for the flavour or for their presumed aphrodisiac effects. Fish from all over the world are sold here. 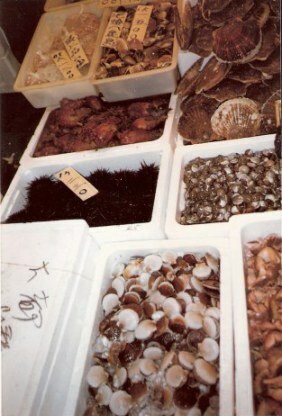 Tsukijii - the Tokyo Fish Market, is to fish, what Amsterdam is to flowers. I remember that before fast broadband and WiFi, one of the earliest uses of the internet from a community 'Telecentre' in Australia was by fishermen in Tasmania. 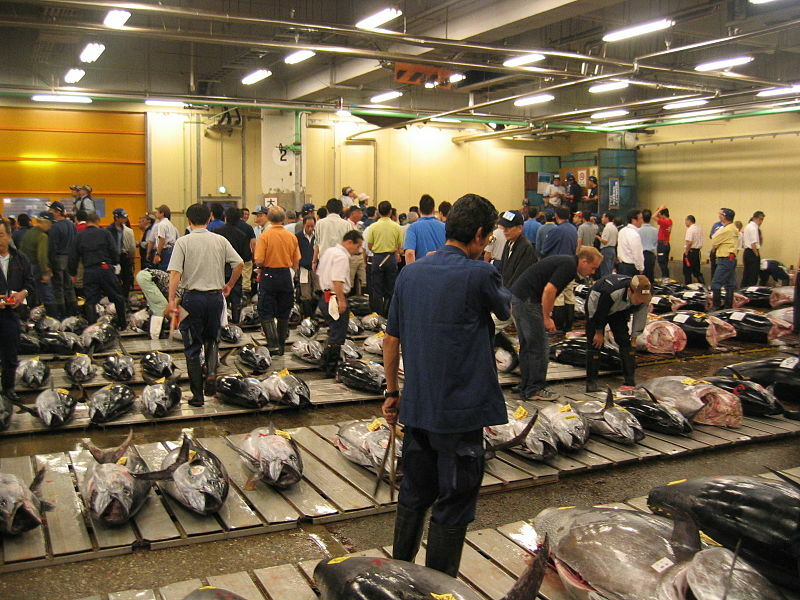 Through their Community Telecentre they had direct access to selling prices at the Tokyo Fish Market, freighting their catches direct from their port to Tsukijii on demand. Australia is not alone as an exporter to the Tokyo Fish Market: over 2000 metric tons of seafood passes through Tsukijii every day. It's a huge business, employing around 65,000 people:market stall owners, auction houses, and all the various support industries and professional services – and that doesn't include the thousands of fishermen who supply it directly. It seems surreal to enter this very different world that sits beside the busy business centre of Tokyo. those who fish for sport and those who fish for fish. Tsukijii, the Tokyo Fish Market, is an interesting place for the traveller with a fascination for the 'out-of-the-ordinary'. Here, you can review the catch of the second of these two types of fishermen.